In enacting the Americans with Disabilities Act (ADA), Congress specifically encouraged the use of alternative methods of dispute resolution, including mediation, to resolve ADA disputes. Established in 1994, the Department's ADA Mediation Program has achieved remarkable results, eliminating architectural, communication, and attitudinal barriers for thousands of people, while allowing the Department to achieve meaningful compliance with the law without having to allocate scarce resources to investigate or litigate these disputes. Over 5,000 complaints have been mediated in communities large and small throughout the country, with more than 75% of them resulting in successful resolutions. 1. What is the ADA Mediation Program? The Department of Justice’s ADA Mediation Program is an important part of ADA compliance. Using professional ADA-trained mediators throughout the United States, the Program provides a confidential, voluntary way to resolve ADA complaints fairly and quickly. Mediation is an informal process in which a neutral third party helps parties find mutually satisfactory resolutions of their dispute. 3. What types of complaints does the ADA Mediation Program resolve? Program accessibility: alleging that a city hall’s public meetings are held on the second floor of a building that does not have an elevator. 4. Why should I participate in the ADA Mediation Program? Mediation allows the parties—not a judge, jury or mediator—to develop their own solutions to ADA disputes. Mediation can offer a quick and satisfactory resolution of a dispute and can be far less expensive and time-consuming than a formal investigation or going to court. Mediation may mend relationships between parties. Parties do not lose any rights in attempting mediation. Mediation is confidential and voluntary. 5. What happens during mediation? Mediation usually involves one or more meetings between the disputing parties and the mediator, a trained neutral person who helps the parties communicate with one another but does not make decisions for the parties. It is not uncommon for mediation to involve one or more confidential sessions with individual parties and the mediator. 6. How much does mediation cost the parties? There is no cost to either party. 7. How can I request that my ADA complaint be mediated? Follow the usual procedures for filing a complaint with the Department, and note on the complaint that you would be willing to mediate your dispute. The Department will make every effort to offer mediation to parties interested in participating in the Program. Instructions on how to file a complaint are on our website: www.ada.gov/filing_complaint.htm. 8. What will happen if I file a complaint and the Department decides that it is appropriate for mediation? If we decide that your complaint is appropriate for mediation, we send you an explanation of the mediation process, technical assistance materials, an offer to participate in the Program, and a Release for Referral to Mediation form for you to sign and return within 30 days. Our receipt of this signed form means you have accepted our offer to participate in the Program. The person who files a complaint is referred to as the complainant. 9. If someone files a complaint against my company or against the State or local government I represent and wants to mediate, when will I be informed? Once the complainant agrees to participate, we will notify you, in writing, that a complaint has been filed against you. You will be offered an opportunity to participate in mediation, and provided technical assistance materials. The letter also states that we will not pursue an investigation while mediation is pending. The entity against whom the complaint is filed is referred to as the respondent. 10. What happens after the complainant agrees to mediate? The mediation contractor, the Key Bridge Foundation (KBF), will assign you a case manager to handle the matter. The case manager will contact the respondent to discuss the opportunity to resolve the complaint through mediation. Once the respondent agrees, the case manager works with both parties to arrange a mutually agreed upon time, date, and location for the mediation. KBF is a nationally recognized provider of mediation and training services. 11. What if the respondent refuses to participate in mediation? If the respondent refuses to participate in mediation, KBF returns the complaint to the Department for review. After reviewing the complaint, the Department may decide to initiate an investigation. 12. Where do the mediations take place? Most mediations occur locally in mutually agreed upon neutral locations. Mediations may also take place by teleconference as needed. 13. What if I need an accommodation for the mediation? The Department ensures that all mediations are accessible to all participants. The Key Bridge Foundation and the mediators are skilled at handling requests for accommodations for people with disabilities, such as arranging accessible locations for mediations, providing sign language interpreters, and arranging other accommodations to ensure full and equal access to the mediation process, at no cost to the parties. 14. Who are the mediators in the ADA Mediation Program, and where are they located? All mediators in the Program are professional mediators who have been trained in the legal requirements of the ADA and have a great deal of mediation experience. They are located throughout the United States. 15. Can I bring an attorney to the mediation? Yes. Either party can be represented by an attorney, but it is not required. Attorneys in mediation generally advise their clients, but the parties speak on their own behalf. 16. What happens if we start the mediation process but I am uncomfortable continuing in it? You may speak with your case manager to resolve any problems you experience during the mediation process. Either party can withdraw from this voluntary mediation process at any time. 17. Can compensation be discussed as part of the mediation? Yes. However, any discussion of monetary or other compensation must be mutually agreed upon by the parties. Although compensation is often part of agreements, it is secondary to ensuring that the issue is appropriately resolved. 18. Does the mediator decide the outcome? No. The parties themselves decide the outcome of mediation. 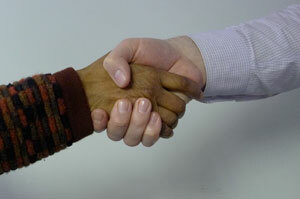 The mediator helps move the conversation along and assures the fairness of the mediation process. 19. What are the possible outcomes of mediation in the Program? A successful mediation results in a binding agreement between the parties. Resolutions may include removing barriers, implementing compliant policies, conducting training, paying money to complainants, and/or providing a simple apology. If mediation is unsuccessful and an agreement cannot be reached, parties may still pursue all legal remedies provided under the ADA, including filing private lawsuits. 20. How does the Program ensure that implementation of the agreement will occur? To ensure that relief is actually obtained, no matter is deemed successfully resolved and closed until both parties verify the full implementation of the terms of the agreement. visit the ADA Website and click on the link near the bottom of the right-hand column. Call M-W, F 9:30 a.m. – 5:30 p.m., Th 12:30 p.m. – 5:30 p.m. (Eastern Time) to speak with an ADA Specialist (calls are confidential) or call 24 hours a day to order publications by mail.